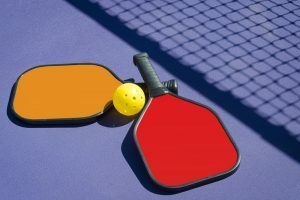 Don’t let the same routine put a damper on your exercise enthusiasm try a fun game of Pickleball or Racquetball. 3 Courts not available during school holidays. Racquetball is a game similar to handball but played with rackets. The game is played on a four-walled court with a short-handled racket and a ball larger than that used in handball. 2 Courts are available for members use. They may be reserved in advance. League information is available upon request.